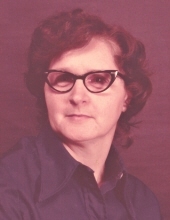 Velma L. Haga, age 86, of Caldwell, Ohio, formerly of Belle Valley, died Monday, January 28, 2019, at Genesis Hospital in Zanesville. She was born May 24, 1932, in Calais, daughter of the late James Miles and Susan Wava Hayes Hannahs. She was a 1949 graduate of Sarahsville High School and she was a homemaker. Velma was a life member of the Caldwell Fraternal Order of Eagles #2952, the Belle Valley American Legion Auxilliary Post #641, and the Guernsey Chapter #211, Order of the Eastern Star. She enjoyed playing bingo and she was devoted to her family. In addition to her parents, she is preceded in death by her husband, Bennie J. Haga, who died November 19, 1991; two sons, John M. Haga and Jerry W. Haga; twin daughters, Darlene Connolly and Charlene Haga; one grandson, Danny Connolly; one sister, Frances Stoner; and two brothers, John Emmerson Hannahs and James Austin Hannahs. Surviving are her daughter-in-law, Jennifer Haga of Caldwell; five grandchildren, Tracy Connolly and Travis (Dana) Connolly, all of Caldwell, Cindy Ann of Indiana, and Nicole Haga and Ben Haga, both of the home; 10 great-grandchildren; 5 great-great-grandchildren; and many nieces, nephews, cousins, and friends. Friends may call Thursday, January 31, 2019, from 4-8PM at McVay-Perkins Funeral Home, 416 East Street, Caldwell, where an Eastern Star service will be observed at 7:30PM. The funeral service will be Friday, February 1st at 11AM with Pastor David Cater officiating. Burial will follow at Sharon Cemetery. Memorial contributions may be made to the Caldwell Volunteer Fire Department, P.O. Box 24, Caldwell, Ohio, 43724, or the Belle Valley American Legion, 131 Brown Street, Belle Valley, Ohio, 43717. To plant a tree in memory of Velma L. Haga, please visit our Tribute Store. "Email Address" would like to share the life celebration of Velma L. Haga. Click on the "link" to go to share a favorite memory or leave a condolence message for the family.